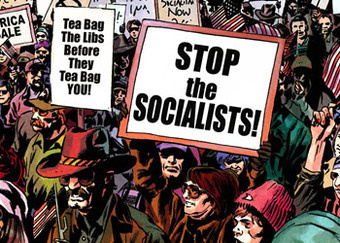 So far all very hilarious but it is a shame that Marvel have capitulated so quickly, with Editor in Chief Joe Quesada blaming the letterer and insisting that the protestors were not meant to be Tea Party protestors but rather “a generic protest group” who just happen to be “anti-tax”. To this poor bear of little brain on the other side of the Atlantic, Quesada’s distinction – and the American right’s indignation – are both a little hard to understand. What Quesada seems to be suggesting is that if an explicit link between the real Tea Party movement had not been made that somehow the implicit link would not have been there. Meanwhile the Tea Party Movement themselves seem to be getting their knickers in a twist because of the use of a placard which, for anyone else, would be excruciatingly embarrassing. Within all this is the more substantive accusation that Marvel were implying that the Tea Party Movement was racist, on the grounds that a black character did not feel comfortably mingling in a crowd of “angry white folks”. Quesada’s defence here is somewhat more robust, and rightly so. He could have gone further: not only was it realistic to give a black character qualms about the protestors but isn’t it an issue the Tea Party themselves need to address? All this comic has done is hold a mirror up to the Tea Party and ask questions (whether Quesada is comfortable about admitting this or not). 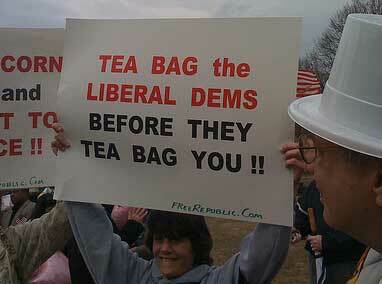 If the Tea Party don’t like what they see, they need to ask themselves questions. But then, since when has that stopped them from doing anything? The writing’s on the hand wall. Benjamin Woolley’s BBC4 series Games Britannia has been a tantalising documentary thus far. For a political gamer such as myself, much of the first two episodes have been meat and drink. I have to admit to not knowing that Snakes and Ladders was adapted from an Indian game called Moksha Patamu which was all about karma and enlightenment and many of his insights are truly fascinating. To the surprise of no-one who reads this blog, I was delighted that it went into so much depth about how Monopoly formed from Elizabeth Magie’s Landlord’s Game, itself designed to educate the public about the need for land value taxation. But after its section on Monopoly, this week’s episode started to lose its momentum. Cluedo rightly got name checked, but it quickly moved onto a narrative that I just don’t think is accurate. That is, that all the British games companies got bought up by Hasbro, the British games industry died a death and that only British games of note since the 1950s are a game called Kensington and the infamous War On Terror. The most aggregious aspect of this narrative is that it completely ignores Games Workshop, now a publicly listed company and one which owns a shop in every major British city and town (as well as numerous outlets worldwide). Like a lot of gamers of a certain age, GW is something I feel quite ambivalent about as it seems to be more about making money than producing good games. But its empire, while not as vast as Hasbro’s, is undeniable, and now includes a significant number of computer games, novels and licensed boardgames (ironically, the best GW games aren’t actually published by them these days). Quite why this company has managed to grip the imaginations of so many (mostly) adolescent boys for two generations is surely worthy of exploration. Yet the best Woolley could do was interview co-founder Steve Jackson (presumably we’ll be hearing more from Steve in the third episode which focuses on computer games and he gets to wax lyrical about Lara Croft – d’oh! Got mixed up between Steve and Ian Livingstone there) and show some old footage from a Games Day in 1982. This is a global leader and deserved better treatment, but it seemed to be a victim of a pre-formatted narrative. The other aspect only touched upon, is the renaissance of boardgames over the past decade. Not in the UK, and not in the US, but in Germany. This gives a lie to the other part of Woolley’s narrative that simply doesn’t add up: games aren’t all US brands marketed around the world in the year 2009. In Germany, games like Settlers of Catan are huge – as big as Scrabble and Monopoly – and home grown. During the height of Lords of the Rings mania in the early noughties, you could find copies of the Lord of the Rings boardgame in every bookshop. Desgined by a German, Reiner Knizia, he is one of the world’s most successful game designers. And he is English by adoptive country. Surely the man deserved some credit. With no disrespect to the War on Terror guys meant at all, he is certainly a more important figure than them. Reiner Knizia aside, the whole phenomena of why Germany has become such a focus of innovation is surely worth some study, as is their choice of subject matter. Unlike the US and UK tendency towards militaristic games, the Germans focus on concepts such as trade and economic development. And unlike Monopoly, which takes hours to play and leaves people out of the game twiddling their thumbs (if they haven’t already overturned the board in a fit of rage), German games are much more inclusive and concise. If you are going to do a documentary about the faltering fortunes of the British games industry in the 21st century, it seems ludicrous not to contrast it with the very different direction of the industry in our main 21st century adversary. Germans don’t get completely ignored; the programme includes library footage of the massive Essen Games Fair in 2008 and Woolley does at least mention that a lot of games are designed by Germans these days. But this is a major and misleading gap in the narrative, and a very frustrating one. It is one thing to make a documentary about Britain’s gaming history; another to wallow in Anglo-Savon chauvanism. Will tomorrow’s episode rectify this? If it is to be all about computer games, I somehow doubt it. UPDATE: Having seen the third and final part of Games Britannia, I stand a tiny bit corrected. This episode opens with the founding of Games Workshop, although it doesn’t explore anything that happened after 1976. It was a fascinating episode, rightly celebrating the UK computer game industry, and well worth watching. I still maintain however that there is an important gap in the narrative. I still haven’t got my post-election blogging groove back. In the meantime, here are this week’s news referencing Henry George out there in the internets. See also FDR’s Second Bill of Rights and the Progressive Mission and Resurrecting Henry George: The Case for National Housing Assistance. George also gets a brief namecheck on the Huffington Post this week. Old Henry also appears to have been the inspiration for a sculpture garden in Fairhope, Alabama. Over in New Hampshire meanwhile, Professor Richard England is making the case for a land value tax. I’ve noticed a slight increase in talk about LVT stateside recently. Is it the start of a post-crash trend? Time will tell. Related to my previous post, I was a little disappointed by this article, which promised so much yet failed to deliver. The last time the Democrats controlled the White House and both houses of Congress, Gillian Anderson wore pants. There were two Star Trek series at once, which promoted women and minorities and looked at the dark side of the Federation. Cyberpunk reigned supreme. The future was a shiny place â€” but with dread lurking just beneath its polish. Now that the Democrats have finally scored another grand slam, are we going to see the return of sunny-but-questioning science fiction? The main thing it lacks is a contrast between sci-fi under Bush with sci-fi under Clinton. First of all, let’s be clear that Star Trek: The Next Generation was a product of the Reagan/Bush Snr years: there were only one-and-a-half seasons under Clinton; its optimism was entirely driven by the ending of the Cold War. DS9 and Voyager are authentically Clintonian and they took the franchise down a much darker path than their predeccessor. TNG’s two greatest contribution to Star Trek were the rich development of Klingon culture and, of course, the Borg. The former was a rather more optimistic look at Middle Eastern culture than would ever have emerged post-9/11 while the Borg is of course influenced by communism (although these days, anxieties about assimilation of the individual would no doubt be presumed to be anxieties about Islam). DS9 and Voyager by contrast gave us ideas about living in a divided society. Both Bajoran and Human societies have their culture wars. The Bajorans are also “good” arabs (Bajor = Kuwait/Saudi Arabia) while the Cardassians are the mean old Syrian/Iranians. Meanwhile, with the humans, Trek was able to explore what was increasingly becoming a divided USA, the Maquis being all but cheerleaders for Ruby Ridge and Waco. You could easily imagine B’Elanna Torres blowing up the Oklahoma Federal Building. How does all this contrast with Star Trek in the Bush Jnr era? I’m not the first to observe that Enterprise was the Bush Doctrine in Space. Captain Archer even resembles Dubya. In the first series they seemed to stumble from one major diplomatic incident to the next. The Xindi were as transparent an analogue of Al Qaeda as you are ever likely to get. As for the fourth season… well, I couldn’t tell you because I had given up by that point. The main difference between Clintonian sci-fi and Bushian sci-fi is that the latter is far more miserablist. Dare I say that doesn’t necessarily make it bad? In Buffy we had a superhero learning that life was hard, while in Angel we had a vampire discovering that superheroics is equally complicated. Both have in spades something which all too often Star Trek lacked: drama. The reboot of Battlestar Galactica may be darker than the original, but it is far superior. And while in the post-9/11 world we may have lacked the spectacle of Independence Day, we still have hope. Children of Men is about as dark a film as you can get outside of Schindler’s List, but its ending is far more emotionally uplifting than any 90s cheesefest managed to deliver. As I wrote in my Watchmen post below, entropy is a key theme in 90s sci-fi, but there is always some measure of hope, and that leads to a pretty mighty payoff when it is made to work well. Think the ending of Sunshine or the flashes of hopefulness during the darker points in Spider-Man (1 & 2 – the less said about 3 the better, sadly). How will this change under Obama? Well, the io9 article cited above already points to the new Star Trek film and its return to a 60s ethic. But the transition film, thinking about it, may yet end up being The Dark Knight. Characteristically Bushian in its darkness, the film is riddled appeals to hope and optimism. In a year characterised by elections, one of its key motifs (borrowed from The Long Halloween) is the election slogan “I believe in Harvey Dent” – Obama might have used that one. There surely can be no doubt that this theme about how the hopes and dreams of the people can be embodied in a single good man (even if it is a blond, white man rather than a dark-haired, mixed race man) was tapping into the same undercurrent that Obama’s campaign was also taking advantage of. It ends with not only The Joker defeated, but The Batman recognising the best thing he can do is disappear. The time of madness is at an end. So, we can probably expect a period of greater optimism in our science fiction. Let’s hope they don’t get too carried away however and shut down their critical faculties. Bush may not have done much for world stability, but he’s been a gift for sci-fi. There is something about Alex Salmond I could never tire of slapping, if only he were within arm’s reach. During 2007, this blog would frequently scandalise nationalists by mocking Salmond’s habit of waving claymores over his head to commemorate this or that historical defeat of Scotland in battle. But this photo (right) just takes the biscuit. … square with a plan to divide the UK into a patchwork of mini-states? The only candidate in the US election who has expressed support for independence was Sarah Palin. We should, I suppose, be grateful that at least Alex saw the wisdom of not grabbing hold of those particular coat-tails. 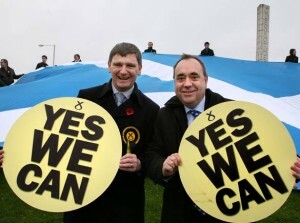 UPDATE: Ah, so the SNP are claiming Obama nicked “yes, we can” from them. Which is a bit like the Lib Dems going around claiming that anyone who uses the phrase “Make the Difference” read our 1997 manifesto. Is UK politics institutionally racist? But we should also be mindful of the fact that neither Obama or Palin did, in fact, come from nowhere. Obama had been a state senator for eight years before entering the US Senate in 2005. Palin also made it in local and state politics first. The difference between these levels of government and their UK equivalents is that they wield far more influence and power. In the UK, even the Scottish Parliament has very few tax-raising powers; in that respect it is no different from a local authority which can only control how it allocates the cash not make strategic decisions about the level of that cash and how it should be raised. As Mayor of Wasilla (pop. 10,000), Palin had powers that Alex Salmond would hanker for. If we don’t have proving grounds such as these, how can we expect our stars to rise (indeed, I made this point about the London Assembly last year)? Currently the only real avenue is the House of Commons, and that is where there is also the most party control. The UK Parliament and the system we use to elect its members institutionally favours candidates who are capable of running their own campaigns and working extremely long hours for years before polling day. Inevitably, this tends to favour rich people, successful entrepreneurs and lawyers, who tend to be (but are not exclusively) white, middle class and male. The Labour Party has an additional category of standard candidate background – the trade unionist – but these days these too tend to be white, middle class and male. For every Dawn Butler there are dozens of Tom Watsons and Sion Simons. Labour these days may be unlikely to foster an Obama, but it is unlikely to foster a Keir Hardie either. Getting elected to the UK Parliament is, currently, an extreme sport. You have to be ever-so-slightly insane to want to put yourself through it. The serious question is whether this is actually healthy? Scrutiny certainly is, but in most parts of the country where we have safe seats, we have patronage in place of that. Fundamentally, we have a system that puts parties, not the public, in control. Some have argued that the solution to all this is to have primaries, but for reasons I have already rehearsed, I don’t think that will work (nor do I think it works well in the US outside of presidential candidate selections). No, if we are serious about putting the people in control, we need a system like STV which combines a fairer electoral system with a more open system for selecting party candidates. If the Equality and Human Rights Commission are serious about exposing institutional racism (and sexism and all other forms of discrimination for that matter), then they should come out in support of electoral reform. In her speech, Ms Blears also complained about a “spreading corrosive cynicism” in political discussion. She turned her fire on political “bloggers” – accusing them of fuelling disengagement by focusing on “unearthing scandals, conspiracies and perceived hypocrisy” and of being written by “people with disdain for the political system and politicians”. “The most popular blogs are right-wing, ranging from the considered Tory views of Iain Dale, to the vicious nihilism of Guido Fawkes,” she said. This on the day that a black man called Barack Hussein Obama won the presidency of the USA with the largest popular mandate anyone has ever achieved in the history in the world, fuelled significantly off the back of social media – of which blogging played a large part. I sincerely hope this post isn’t seen as being disrespectful to someone who was clearly a remarkable woman, but Madelyn Dunham’s death today has a weird kind of appositeness. 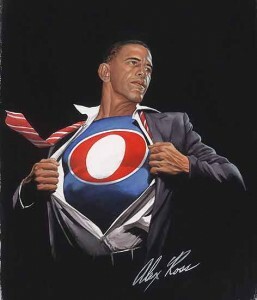 I’m hardly the first person to point out the almost fictional-feeling narrative of Barack Obama’s election campaign. He has a background that is almost too perfect, pretty much ticking every box going. He is almost a living cliche. The death of his grandmother just hours before polling (formally) begins sort of caps that off. The similarities to the West Wing Seasons 6-7 narrative have been well rehearsed (and of course, that plot features an emotionally charged death in the finishing stages as well – which again was a case of reality and art getting mixed up). What is less clearly recognised in the UK are the surreal similarities to the Superman narrative, although this is clearly something not lost on Obama himself. A strange visitor from another continent (work with me here, I’m paraphrasing), who never knew his father yet lives in his shadow, raised by an elderly couple in Kansas, who goes to the big city to make himself… just watch Superman: The Motion Picture (still the best telling of the origin story) to see what I mean. In fiction, everything has a price. It is necessary for Jonathan Kent to die so Clark can become Superman. If you believe in a creator, it is a pretty cruel one who makes Obama pay a similar price on (hopefully) the eve of his victory. But of course the Superman narrative is about as American as it gets – the outsider who not only integrates into the culture but becomes its paragon. It’s the story that makes non-American cynics like myself capable of forgiving the young country every time. That same optimism that makes Donner’s film so evocative (and which Bryan Singer got so horribly wrong in his poorly-conceived sequel) is what fuels the Obama campaign. By contrast I can see nothing of the American Dream in the McCain-Palin campaign, just something much darker. Even Bush didn’t so self-consciously set out to divide his own country in the way that certainly the Palin camp has done. It is truly scandalous. I have to admit that at the start of the summer I would enjoy going around winding lefties up by saying I really didn’t particularly mind who won; McCain or Obama. I wasn’t entirely joking – McCain really did represent something different: finance reform, respect for human rights, economic liberalism. At a stroke however he reversed all that by appointing Palin at the end of August and I was able to not so much come off the fence, but leap off it. So good luck from me Barack. I still have my doubts about your substance, but what you represent is something pretty damn important. You really must win today.